What I really enjoyed about putting this one together was the choosing of the appropriate November colours. Round here our sky bleaches to almost white, the clouds show grey against it and any splashes of colour become a very welcome relief. That's what I was thinking of when I was pulling paper. December will be different. By the end of December I might even have recruited the rest of the family to the counting cause. I left out the macaroons, you see. Two dozen beautiful coffee flavoured treats, baked by The (Not So) Small One, and I left them off my list. I don't think she'll let that happen again. So, December, I'll be counting you carefully. What a great idea Sian, I might have to give this a whirl in December. I like the colours and patterns you chose, very restful on the eyes! 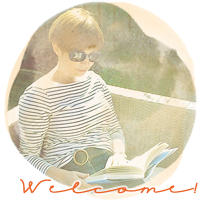 Thanks for the link too, I enjoyed blog hopping rather than cleaning my store room, LOL! Do you know, we had a beautiful pink streaky sky this morning which, as you say, is a welcome relief in such a dark month! Thanks for joining in again Sian - I'll add you to the list once I've done my post on Thursday. I think it is difficult to NOT count the days in December - I don't think you will have any trouble recounting the 12th month! A lovely page today Sian, our sky was as you described, quite unusual for this time of the year. Can't believe that it is nearly December! Another great page Sian. Yes looking forward to some colour - I think the grey skies account for my lack of energy! Oh it's that time again already. Really like how you did the layout for it. So poetic....when I look outside I just see grey and gloom:( Gosh 30 cards done....puts me to shame. I really enjoy your Month in Numbers layouts Sian, and I'm thinking of using this idea for my monthly overview layouts for 2012. Lovely page and lovely colors. My November colors would be grey, grey and more grey. That is, until all this rain we're getting changes to snow, then a little white would be appropriate. 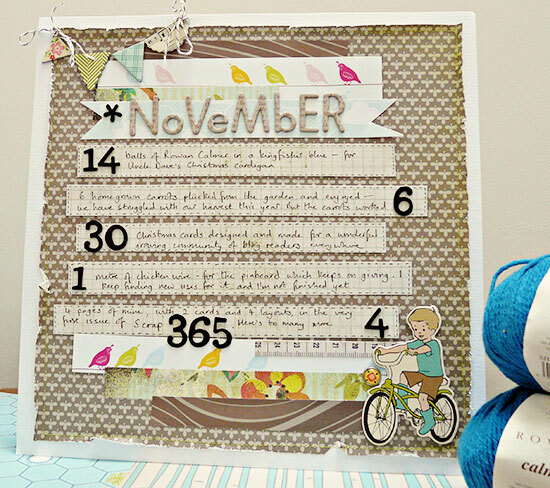 Great page - sometime can you blog about how you keep track of your numbers? I"m thinking hard about storytelling Sunday. . . I want to come up with something special for the final 2011 edition. I take it there will be no Christmas Club this year? A gorgeous page Sian. I think i'll join in again for December and add the page to my christmas journal! I'm obviously thinking along the same lines as Louise. It's also something I'm seriously considering for 2012. The look of the page is fab and yet I never create a page without a photo. I love the colours in your LO which is also just gorgeous. Love the bunting! I was so hoping my cards would be done by now but work keeps getting in the way!!! Absolutely love the layout on this one Sian! This past month has been so hectic that counting has been the last thing on my mind, I'm definitely going to give it a go for December though (which will hopefully be a bit more relaxed). I'm glad you could relate to my last post though your family have my respect, its not job I could ever do! See (read?) you on Sunday, trying to think what I can rustle up for the festive installment! The colours are just perfect for November,Sian. I'd never thought about matching colours to a month but you have certainly captured it very well with the papers you've chosen. Finally got hold of a copy of scrap 365, loved reading your pieces in it! I like the idea of using numbers on a page. Best not forget an important one next time though! I LOVE it Sian!!!! Your choice of colours is so smart for this month! I love how the numbers pop and the little details draw the eyes! Gorgeous layout Sian :) The colours here a very drab, except for the beautiful sunsets I get to see from my window in the evenings at work! I love this idea. I think December will be a hard month to count but I think I might just try :-) Great page as always. Yes, I think leaving someone's work out would inspire them to help you with counting in the future...the macaroons sounds delicious! The sky over Thanksgiving while we were at the river was stunning. The sunrises and sunsets and even the midday drabness (which I've shared in my Wordless Wednesday)were landscapes that just made you appreciate the beauty of our natural world. Do like these lists, thinking of doing something similar next year. Thanks for the inspiration. I do 12 on 12 but the idea of the numbers appeals greatly. your november layout is really gorgeous and the colours would normally be perfect here too but we had the most glorious November I can ever remember with bright blue skies and sunshine most of the month!